Alexandra is a junior at St. Bonaventure University from Baltimore, Maryland. She is currently Majoring in Health Science with two Minors in Sociology and Psychology. Alexandra plans to apply to graduate school next fall for her master’s in social work to become a Licensed Clinical Social Worker. College students have been found to spend at least nine hours of each day on their smart phone (3). Despite classes, extracurriculars, and socializing, college students spend the majority of their time awake on their cell phones. This makes researchers and the public question if we have lost a generation to social media and smartphone use. This question is commonly posed as the world plunges further into the age of digital communication. 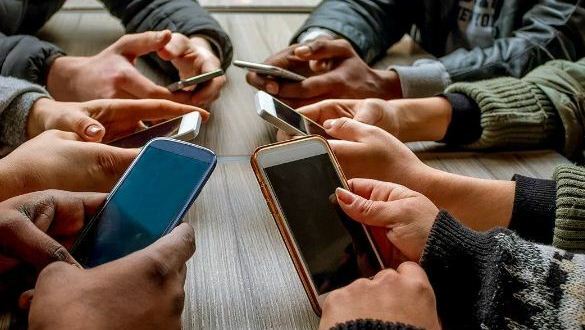 With over 1.5 billion smartphone users globally and 56% of college students in the United States owning a cellphone (3), an “‘always on’” culture has been created, normalizing the dependency the world has on smartphones and social media (2). 52.7% of undergraduate students reported feeling overwhelming anxiety, 67.3% “felt very lonely”, 61.9% “felt overwhelming anxiety” and 33.5% “felt so depressed that it was difficult to function” (2). Despite the abundance of counseling services offered at most universities, there is still a large and growing population of students suffering from mental health issues (2). Research studies are now beginning to question the link between this emerging mental health crisis in college students and the use of smartphones. In one study, depression, anxiety and daytime dysfunctions were found to be notably higher in the high smartphone use group than in the low smartphone use group (3). Young adults, ages 20 to 24 years old, have also been found to have higher instances of stress, sleep disturbances and depression with repeated phone use (2). What does this influx of information have to do with academic performance? Smartphone and social media users have been seen to have depression and anxiety symptoms (3). Those with depression and anxiety symptoms have been found to have poorer sleep quality as well as sleep interruptions (3). Deficient sleep quality negatively correlates with the health and performance of an individual such as obesity, loss of energy, concentration problems and daytime sleepiness (3). All of these factors could affect academic performance in school. Young adults do not even believe that the amount of time spent on their phone is a problem due to the use of cell-phones being so integrated into the modern-day culture (3). If a college student does not think they are spending a great amount of time on their phone, this demographic is not seeing or realizing the damage done to their academic performance through their sleep and social interaction deficiencies (3). Quickly think of traits that could describe a college student. Did the words competitive, ambitious, anxious and stressed come to mind? These words could describe type A personality traits (1). Ask yourself again, would you describe a college student as having high stress levels? I would, considering that on an average day of the week, college students are consumed by a plethora of assignments and tests that were prepared for during an all-nighter full of studying, procrastination, and stress as result of said procrastination. Considering this, students are succumbed to intense levels of stress due to academic and social factors. What correlation do type A personality students and high stress levels have to do with cell-phone usage? One study speculates that these types of students are highly susceptible to smartphone addiction (1). Add this high stress level to the already dominant anxiety and depression levels throughout college students. Smartphones could be used as a coping mechanism for these mental health issues (2). A student looking for a relief through peers on social media could possibly instead increase their anxiety about their own symptoms, feel lower in status if others on YouTube videos appear to do better, have unrealistic expectations about treatment for their symptoms and become more vulnerable to deceiving information (4). All of these factors are major threats to a student’s academic success and overall wellness (2). I am proposing a call to action. A call to recognize the controversial topic of the relation of mental health and smartphone and social media usage. Even though smart phones are a sign of progress in our growing technological society and educators are now requiring e-books instead of the old-fashioned paper textbook, the problems associated with smartphone usage should be recognized, not dismissed (2). University counselors and psychiatrist can help by observing students with anxiety and depression for smartphone addiction (2). Universities should assist the mental health of their students by training their staff and faculty with sessions on digital media in relation to health and wellness (2). If you are a student like myself, become more self-aware. Note the moments when you pick up your smart phone right when you wake up or when you scroll through Instagram right before you go to bed. Think about how you feel looking through hundreds of posts a day. Pay attention to the way you feel during school and any symptoms of anxiety and depression you might be experiencing throughout. Think about how phone usage and mental health are all intertwined. Some strategies to help relieve you of your cellphone-inflicted mental health issues include turning off app notifications or the phone in general, setting time and use limits, mindfulness training, or cognitive behavioral therapy (2). Cell phones possess immense influence over the minds and bodies of students across the country. It is time for students and the institutions that support them to take action- if not for the sake of the present, at least for the sake of future. (1) Boumosleh, J. M., & Jaalouk, D. (2017). Depression, anxiety, and smartphone addiction in university students- A cross sectional study. PLoS ONE, 12(8). (2) Cain, J. (2018). It’s Time to Confront Student Mental Health Issues Associated with Smartphones and Social Media. American Journal of Pharmaceutical Education, 82(7), 738–741.